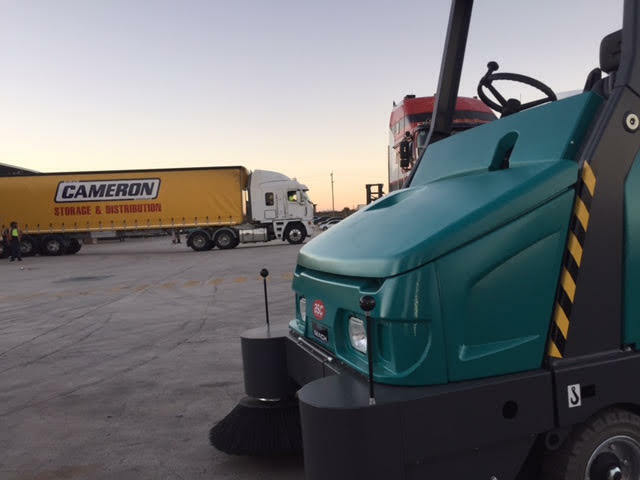 Established in 1975, Cameron Interstate is a leading Australian transport company that specialises in freight services in the industrial and retail sectors. The company was in the market to purchase an industrial sweeper and after evaluating the options, they decided the Magnum was the best machine to meet their specific needs. The Magnum is a highly versatile high-dump sweeper, available in battery, LPG-petrol hybrid or diesel versions and is therefore suitable for indoor and outdoor environments. Completely driven by hydraulics it offers powerful traction, impressive maneuverability and incredible productivity. The Magnum has several features that help keep running costs to a minimum. High-performance polyester house filter with auto-clean cycle and long lifespan. Intuitive controls and easy operation keep training time and costs to a minimum. Top quality materials and components ensure reliability, durability and low maintenance. Total Steel version available with steel reinforcements for additional resistance to impact. Hassle-free maintenance reduces overall running costs. Thank you to Tony Bilos at ACS for sharing this great customer feedback. Australian Sweeper Company (ACS), Eureka’s exclusive distributor in Australia, is nationally recognised as the leading provider of industrial sweepers and scrubbers, offering world class solutions to their clients.